The spelling of Herbertson seems to have regularized, but Harbison not so much. Also, the first vowel seems to have sometimes shifted from 'e' to 'a'. This may be part of the Great Vowel Shift, which was only partial in Scotland and happened rather late. But it should be appreciated that the shift in spelling may not have been simultaneous with a shift in pronunciation. The progression from a to æ to ɛ was not always accompanied by a shift in spelling. 'Derby' and 'clerk' are still 'Darby' and 'clark' in the UK. 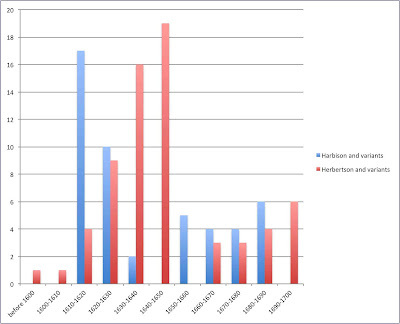 So we don't actually know if Herbertson in 1600 was pronounced 'Herbertson' or 'Harbertson'. Caveats; after 1700, there are records from more counties, and this may have skewed the distribution. And of course, with any database, there may be missing data. But one final interesting graph. 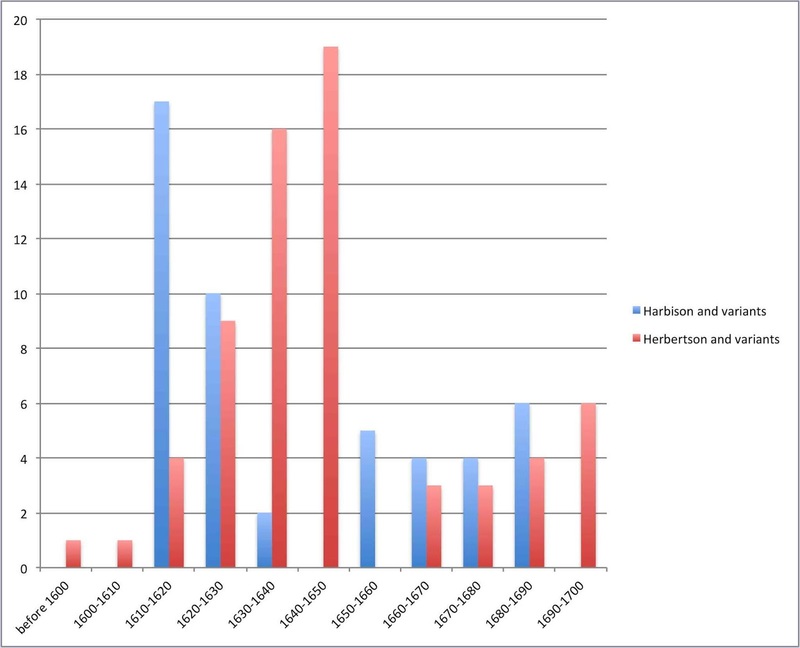 Why the apparent shift from 'Harbison' variants in the early 17th century to 'Herbertson' variants mid-century, and then a total collapse of the numbers? No idea, except 1650 was about when Harbisons started appearing in Northern Ireland.